However, a recent study by a group of researchers at the University of Illinois at Urbana-Champaign, led by Center for Biophysics and Quantitative Biology affiliate professor Yi Lu, resulted in designing the first artificial enzyme capable of reducing sulfite. The enzymatic reduction of sulfite requires the delivery of multiple electrons and protons. To achieve this reaction, the natural enzyme uses a complex active center involving metal ions arranged in a particular way; specific structural features to bind the sulfite; and several weak interactions to tune the activity of the metal catalyst. “Designing a complex active center to catalyze such a demanding reaction has been a major challenge for scientists for many years and succeeding in meeting such a challenge is a testimony of how much we understand nature and take advantage of our understanding to design artificial enzymes for potential applications,” Lu stated. Overlay of the computational model of SiRCcP (magenta carbon atoms) with the crystal structure of native SiR from E. coli (green carbon atoms). Iron and sulfur atoms are drawn as pink and yellow spheres, respectively. According to Evan Mirts, a recent Biophysics and Quantitative Biology PhD graduate and the first author of the paper that has been published in Science, there are many examples of designed proteins with metal binding sites, but few of them have activity anywhere close to their native enzyme templates. Also, there is a lack of design techniques that are specifically dedicated to creating multi-cofactor binding sites closely linked despite such sites being responsible for incredibly important reactions, such as oxygen reduction, nitrogen fixation, and hydrogen production. Inspired by the structure of the natural enzyme, the research team synthesized an artificial enzyme from the bottom up, by starting with a robust protein scaffold that has no activity toward sulfite reduction and incorporating structural features from the natural enzyme to initiate and increase the activity. Using iterations of computational design, biophysical and biochemical studies, the team was able to improve both the catalytic activity and substrate-binding affinity, thus designing an enzyme that closely matches that of native enzymes. The benefits of this breakthrough are multifold. The design approach embraced by the research team can be applied toward the creation of other artificial metalloenzymes, with the added benefit of relying on inherently stable natural protein structures. The successful design of this enzyme is also expected to inspire more synthetic catalysts to remediate sulfite and other difficult-to-treat environmental contaminants. 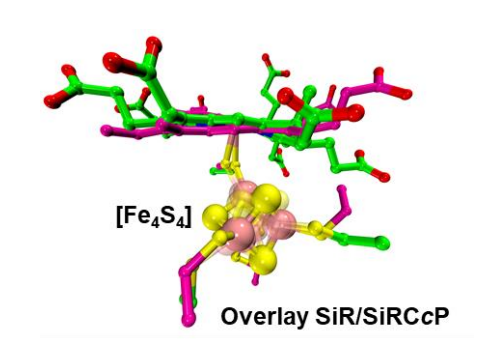 Findings of this research are published in the paper, “A designed heme-[4Fe-4S] metalloenzyme catalyzes sulfite reduction like the native enzyme,” and can be accessed here.